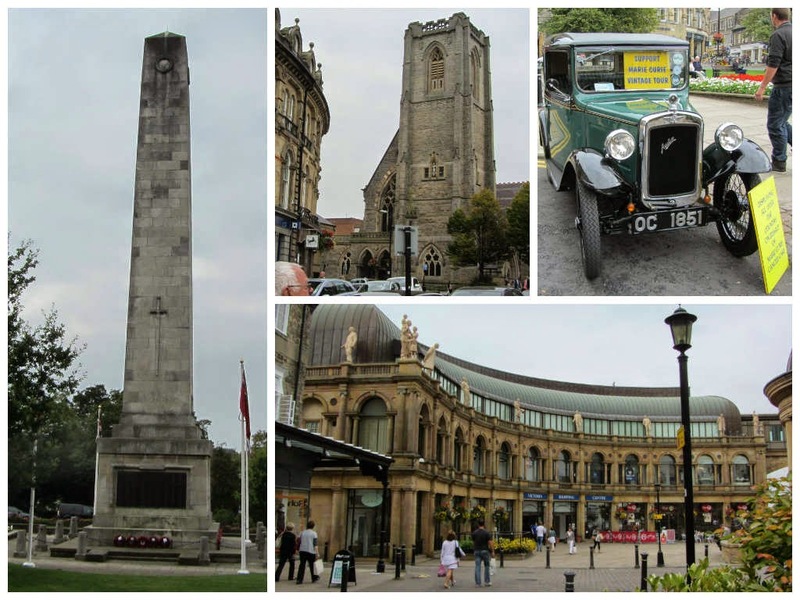 On Friday 12th September 2014 we left for a coach holiday with Newmarket Holidays taking in the Beamish Open Air Museum, North York Moors and Whitby. We were fortunate in being the last to be picked up by the feeder coach so there was no need for an early morning rush to the pick-up point at the Railway Station. We were taken to Peterborough Services just off the A1 to transfer the the main coach. There were two coaches for this holiday. 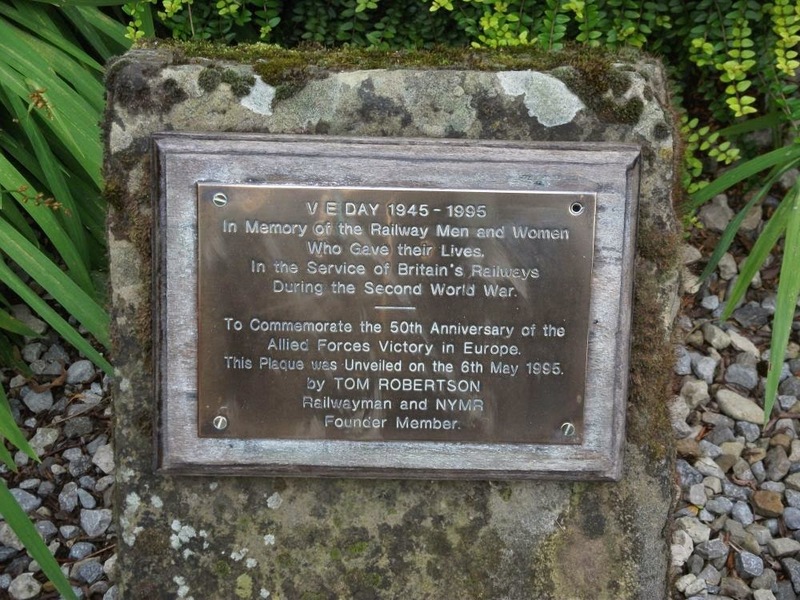 Although we sometimes saw the second coach we didn't know where the holidaymakers were staying. We had a courier with us at all times who was very personable and very knowledgeable, and also supplied us with maps of the towns we visited. The driver was excellent too. Our holiday was very enjoyable and jam-packed with activities. 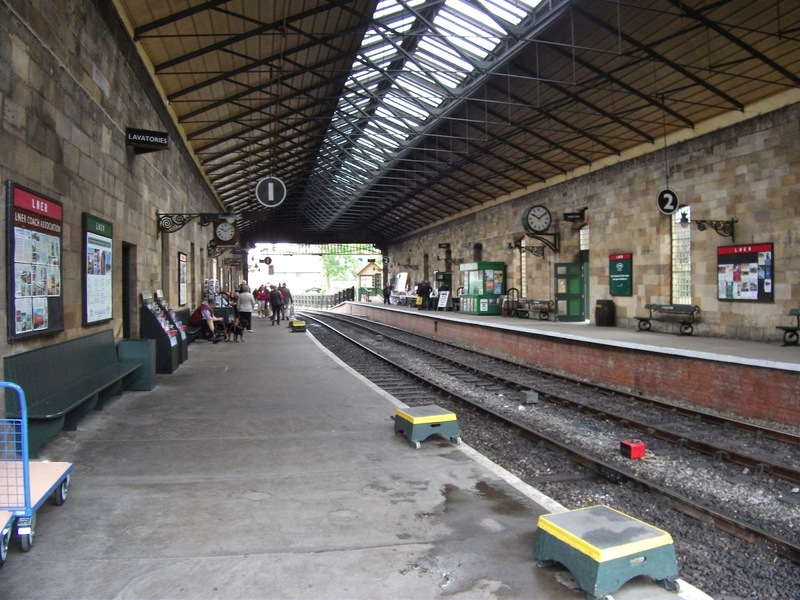 Our major stop northwards was at Harrogate. 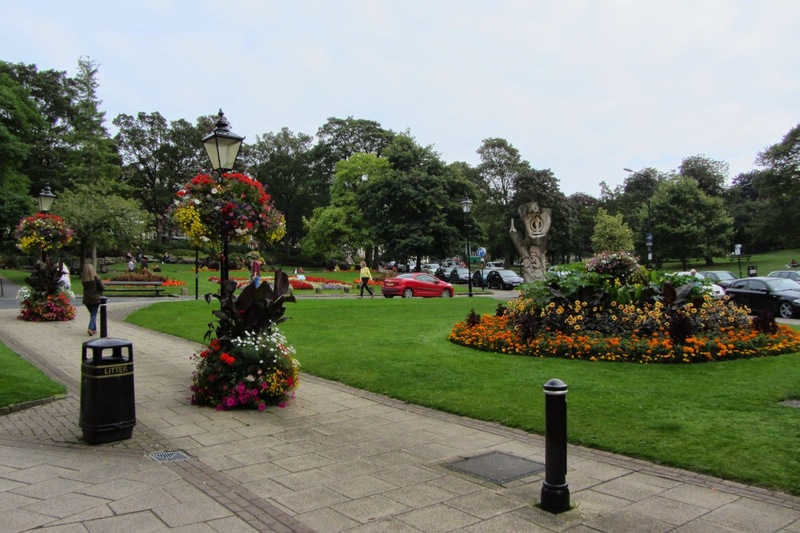 This is a beautiful spa town in North Yorkshire, noted for its floral displays. 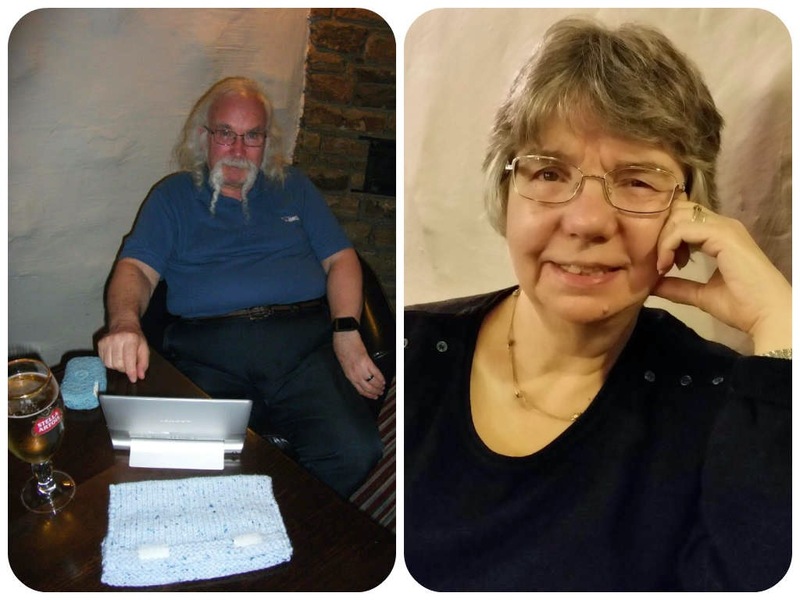 Our courier told us about the spa water, the Royal Pump Room, The Stray, Betty's Café Tea Rooms, and other interesting facts. 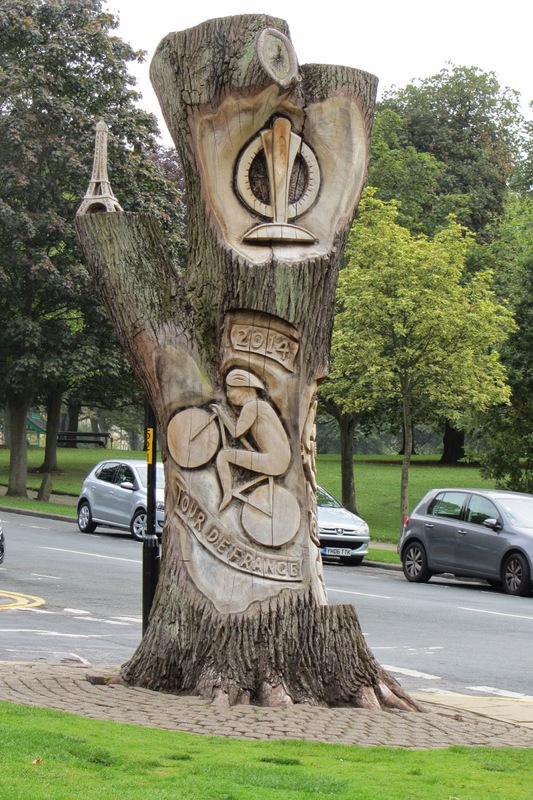 The first stage of the 2014 Tour de France had started in Leeds and ended in Harrogate on 5th July. There was still some Tour de France bunting in some of the shops but not in the streets, and yellow bicycles were still in place. On Montpelier Hill was a beautiful tree sculpture to commemorate the event. The Tour de France went through Cambridge on Monday 7th July. I had made a small contribution to the knitted bunting erected for that occasion. We didn't go into Betty's Café Tea Rooms because there were too many people in there but we did find somewhere else serving tea and cakes which we greatly enjoyed. The weather was decidedly cooler than at home and, although I was wearing a jacket and a summer jumper, I was cold. Looking only for something to tide me over the weekend as I had plenty of knits at home (and should have brought some with me) by chance we discovered a Primark. I was able to buy a cardigan for £6 and a jumper suitable for evening wear for £5. 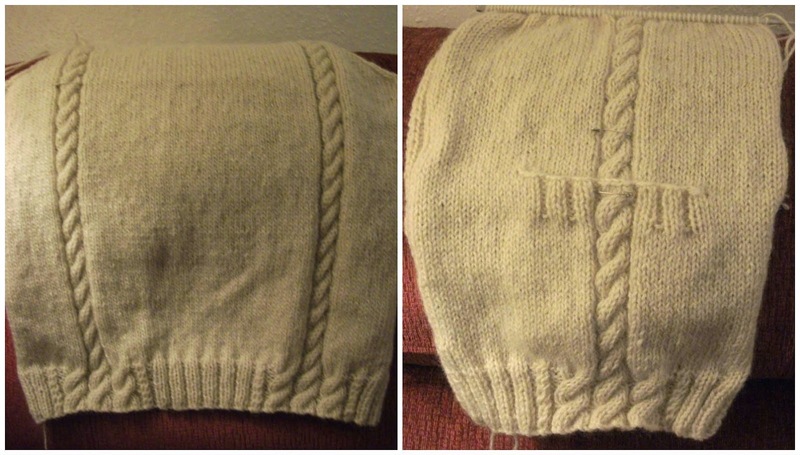 The cardigan had five mother of pearl-style buttons and two spare. I can't remember where but over the weekend I saw a card of six or eight similar buttons in a craft shop on sale for almost the same price I paid for the cardigan. 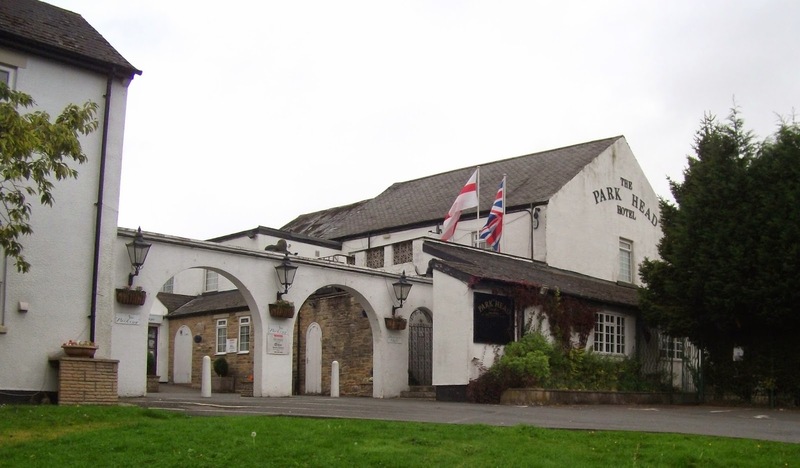 We reached the hotel in the late afternoon, the Park Head Hotel at New Coundon, Bishop Auckland, County Durham. There were some courtyard rooms but we had a room inside the main building. Although the room window faced the courtyard, the courtyard couldn't be seen very well beyond the roofscape. The room was clean and welcoming. The food was excellent, with carvery service for the main course at dinner and self-service at breakfast ~ and plenty of it. As a vegetarian, I had no problem with the food choices and amounts offered. 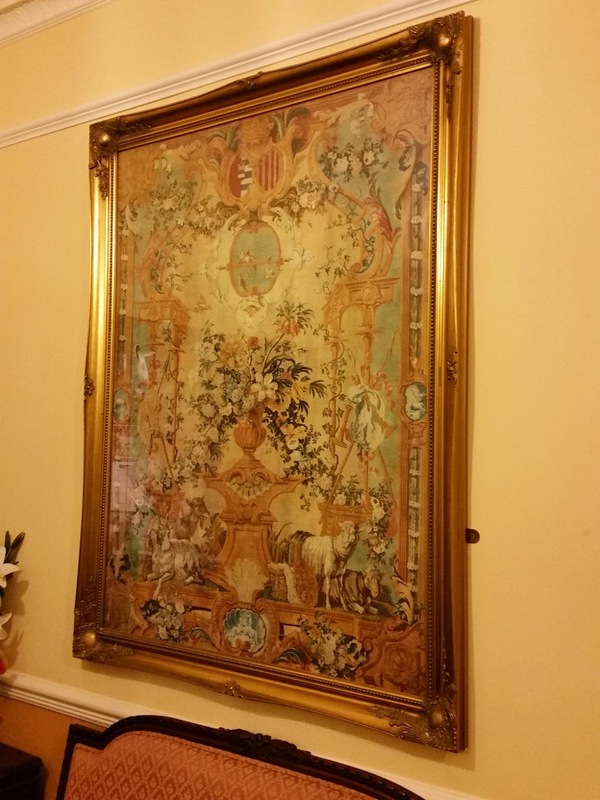 In reception and the dining room were framed pictures which, at first, looked like tapestries, but were excellent lookalikes. In a way we were glad there was no entertainment. This gave us an opportunity to keep on top of electronic messages, to chat to the other guests, and to get to bed early. Right: Me wearing my Primark jumper. Saturday required an early start, breakfast at 7am and departure at 8am. The coach took us over the North York Moors to Pickering, a pretty town in North Yorkshire, where we were to catch the 10.30am train on the North Yorkshire Moors Railway (see also this link: North Yorkshire Moors Railway) to Grosmont. Unfortunately the train wouldn't start and we had to wait for the 11.37am train. 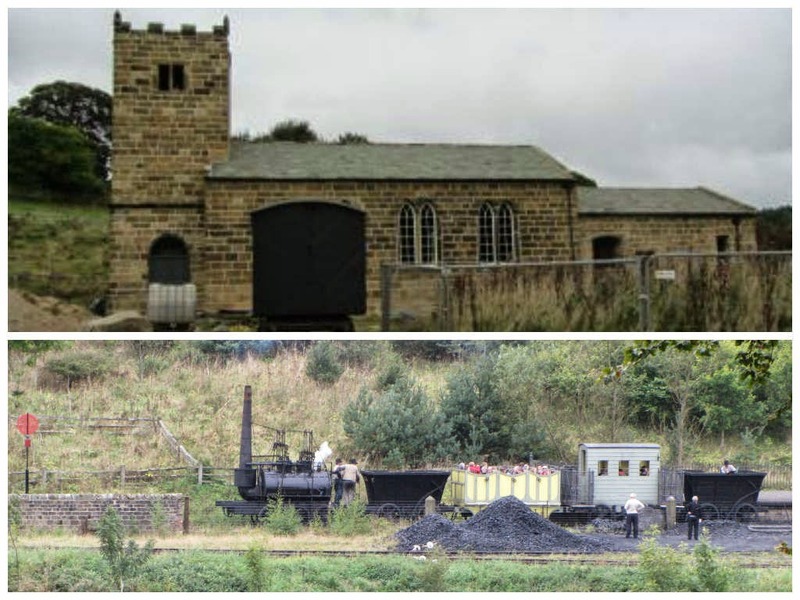 The NYMR preserved railway also passes through Goathland, where the television series Heartbeat was filmed. We had a good look around Pickering station before taking ourselves off into the town. 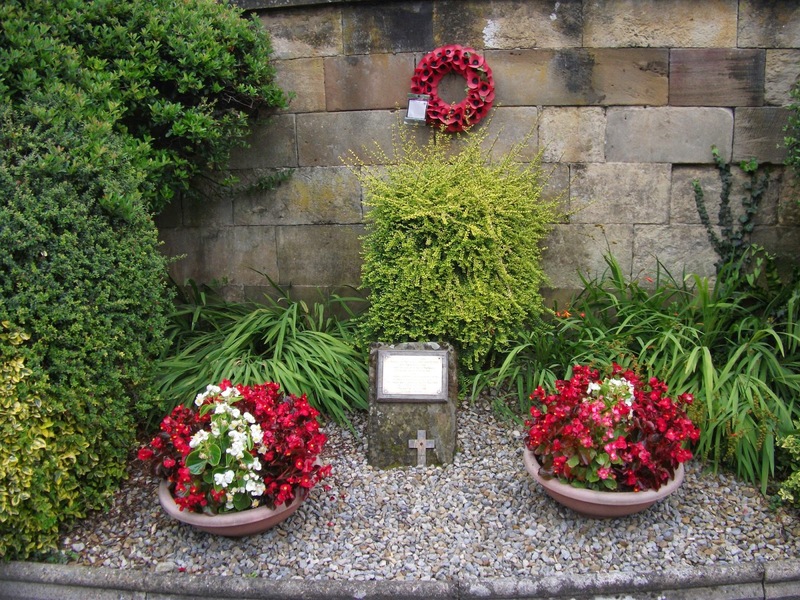 The station had a small memorial garden to the railway men and women who fell during the Second World War. By chance we found Poppies Tea Rooms. Teapots with hand knitted cosies in one window, a basket full of knitted hedgehogs, yarn and patterns in the other. Inside we found a single room divided into a small tearoom area, a knit and natter session, and areas for yarn and patterns and.... Just perfect for me! 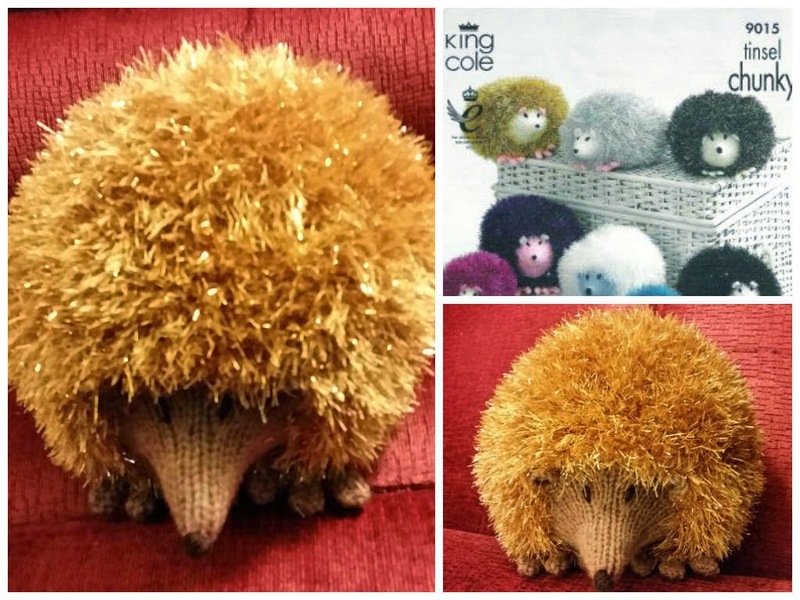 Considering my passion for knitting and our passion for hedgehogs, the hedgehog pattern ~ King Cole 9015 ~ and yarn ~ King Cole Tinsel Chunky, colour Gold ~ were immediately bought and kept until we got home. The pattern gives instructions for Small, Medium and Large hedgehogs. We choose Large. He measures 25cm (10 inches) from tip of nose to rear end. Completed knitted hedgehog, which we have named Tinsel Ted. 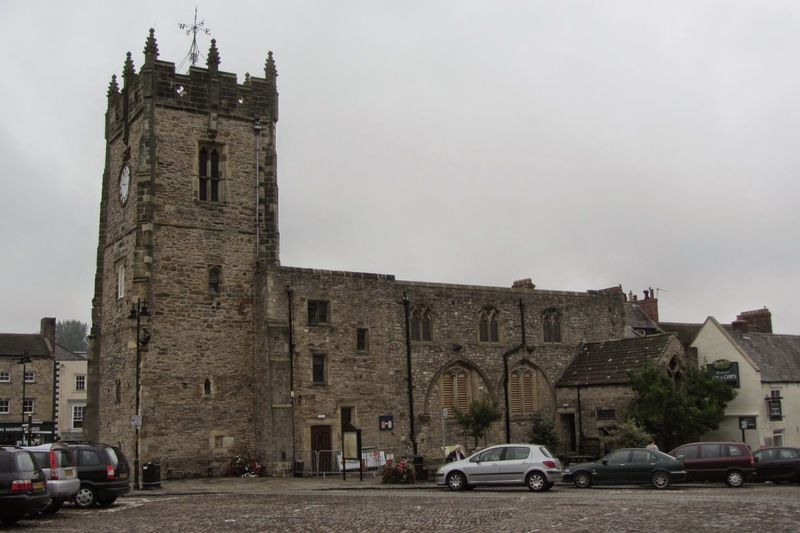 We continued our wander around the town before finding another, bigger, tea room ~ Bothams. We were about to order tea for two when we spotted on the menu an 'all day' cream tea at a very reasonable price so we settled on one of these. An enormous scone each, a small jar of jam each and a more than adequate dish of thick cream each, plus the tea. All with more than £2 change from a ten pound note. Highly recommended. We wended our way back to the station and caught the train. 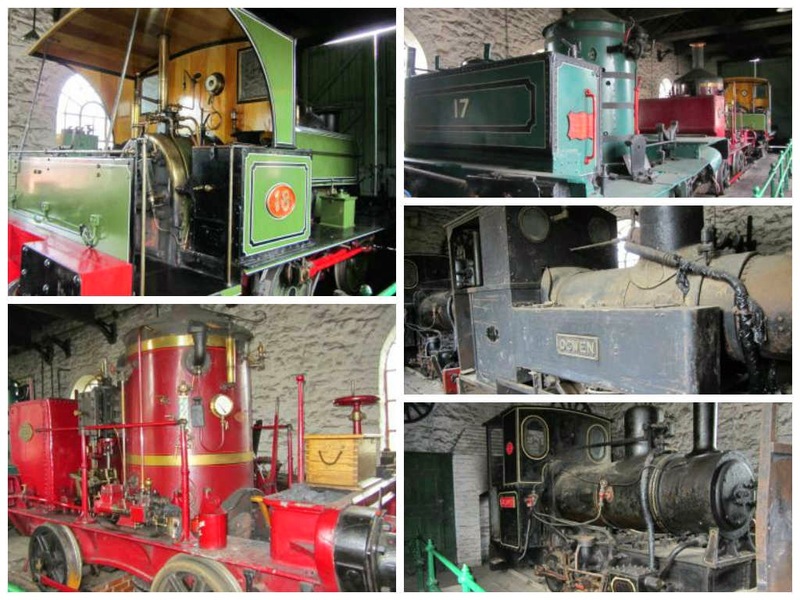 It was diesel engine ~ as befitted the special diesel engine weekend ~ and not steam but it didn't matter. The blocks on the edge of the platform are there for a reason ~ there is a high step and a wide gap to negotiate to get on the train. On the journey we saw the Sir Nigel Gresley Pacific engine (see also http://en.wikipedia.org/wiki/LNER_Class_A4_4498_Sir_Nigel_Gresley). When we reached Grosmont the coach was waiting to take us on to Whitby. The drive into Whitby was incredible, with beautiful views of the town from the high ground. On reaching Whitby we telephoned our friend Pip who came to pick us up and take us home to Wragby Farm for a brief visit. She made us very welcome, offering tea and cheese sandwiches with delicious home made chutney. Duke, not knowing us, suitably raised the alarm but he soon settled. 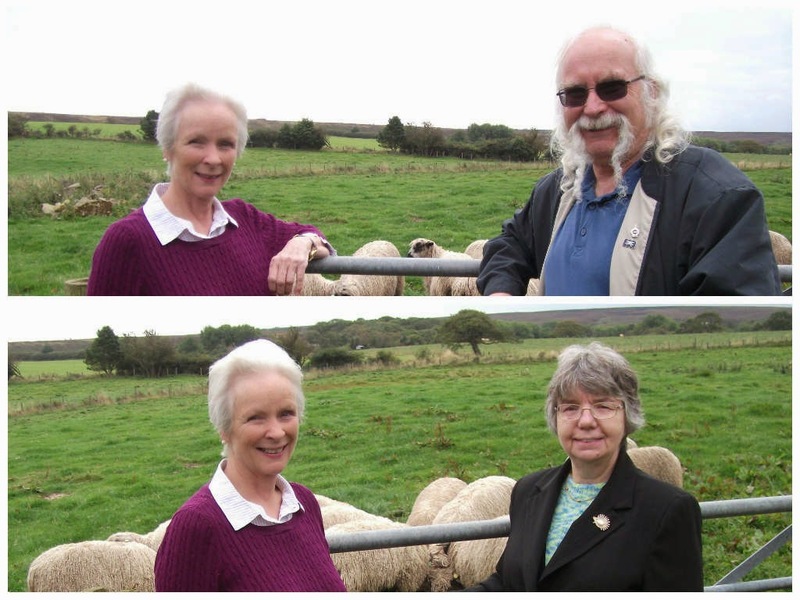 After much chatting and catching up, we went to see Pip's Teeswater sheep, including the recent prizewinners. 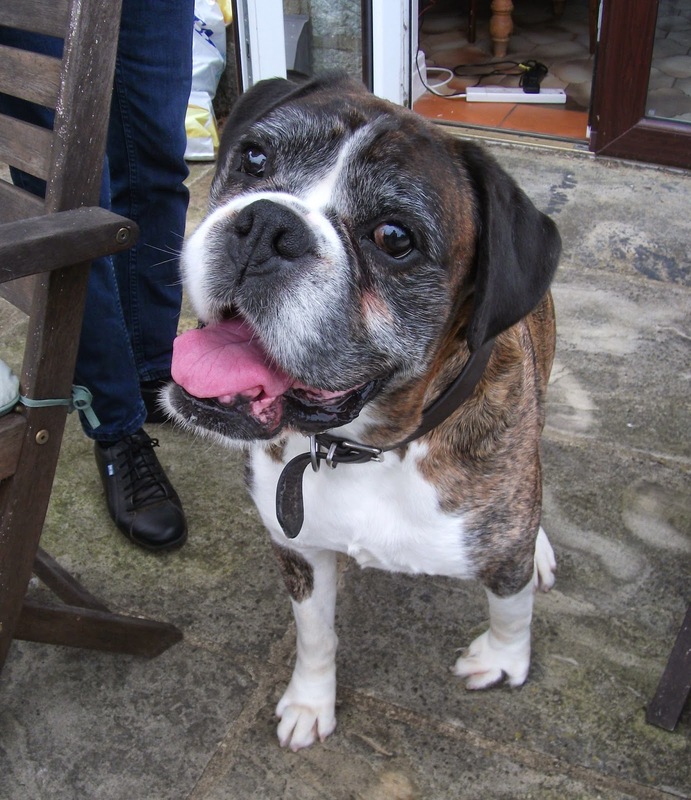 It must have been in 2007 when we visited Pip while we were on a coach holiday based at Scarborough. We missed her when we later stayed at Bridlington. 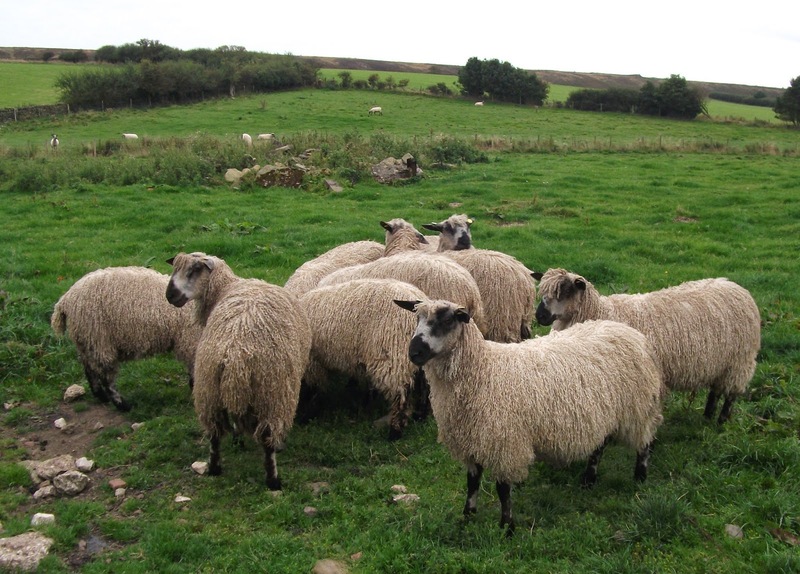 During that 2007 visit I ordered some of the yarn that had been spun from Pip's Teeswater fleeces. I designed and started to make myself a jacket, finishing the back and part of one of the fronts. At that time I was still working and active in the community so was not as speedy knitting as I should have been. The pattern has long since been misplaced but I intend to find it and continue with the garment. I did not dye the yarn before knitting because I wanted to keep the natural fleece colour and lustre. Teeswater jacket back and part of left front. We didn't have much time and all to soon it was time to leave. We didn't see Pip's Dexter cattle except for a wave as we drove past the field on the way back to Whitby. Thank you Pip for a wonderful meet up. We hope to see you again soon. We returned to the hotel by coach but I slept most of the way and missed the North York Moors scenery. In fact I slept a lot on the coach, often leaning over into the aisle and waking up wondering where I was. Another good dinner followed by an early night. At least Sunday's breakfast wasn't until 8am. We left the hotel at 9am to go to Beamish Open Air Museum. We had already decided where we wanted to go and had planned our route. 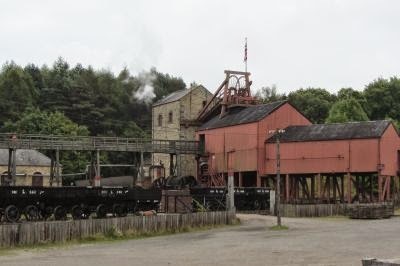 We started off walking from the entrance building to the colliery, first taking ourselves around the winding engine building. We went to the Mahogany Drift Mine where we were taken inside the mine by an extremely knowledgeable, enthusiastic and interesting guide. 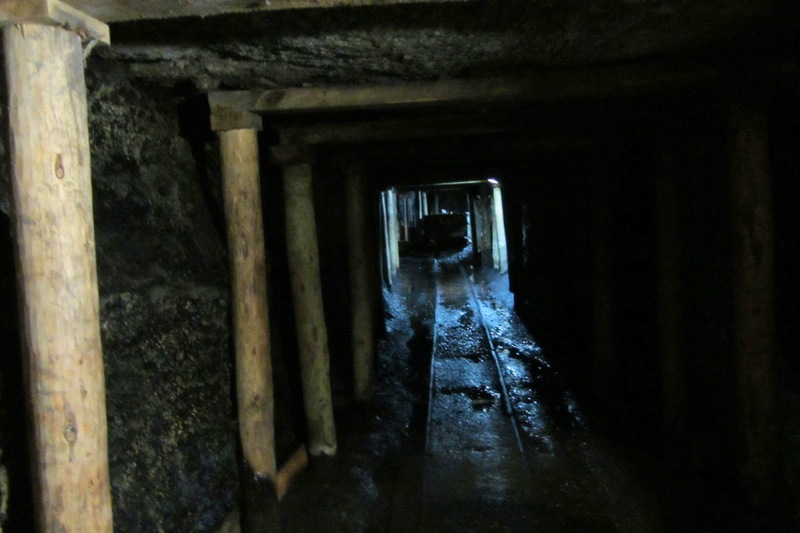 It started off OK, walking upright, but then the mine became darker and darker, lower and lower, wetter and wetter. We were grateful for the protection of hard hats. 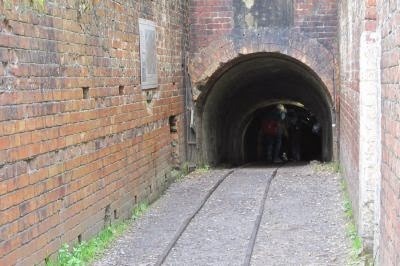 The guide described how men would work eight hour shifts, the shift times not starting until the men had reached the coal face, often working in spaces only 18 inches (46cm) high. He turned off the light and nothing whatsoever could be seen. As well as men and boys, ponies worked in this mine. 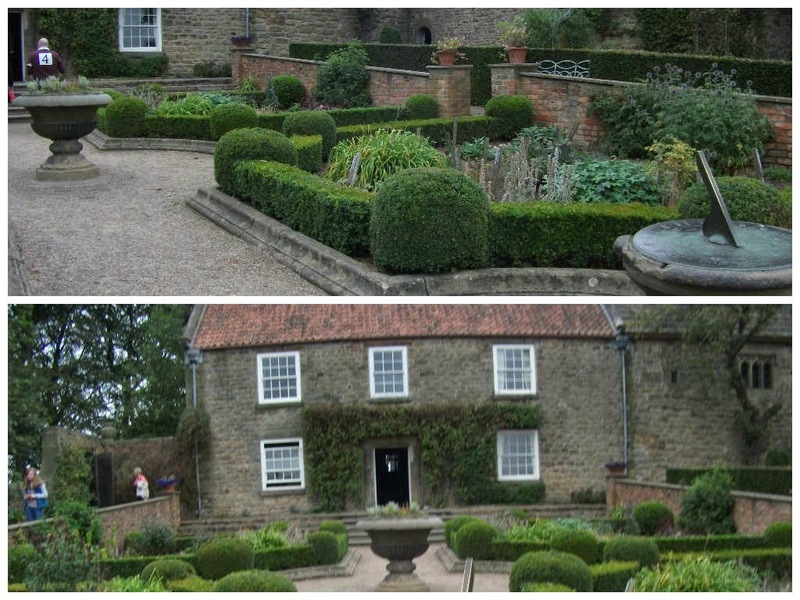 The gardens were at the front of the houses and each garden was different. 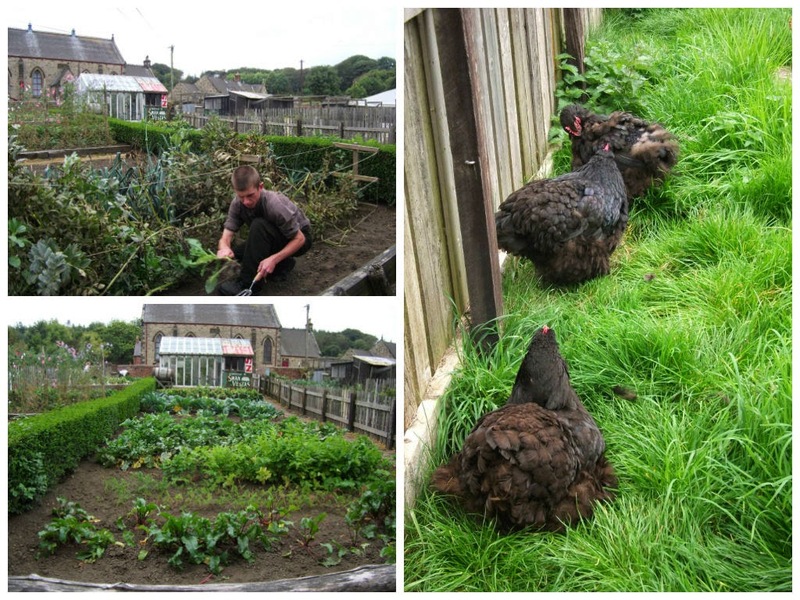 One completely turned to vegetables, one with livestock and so on. Inside the houses were fully furnished in the style of the time. Women were cooking in kitchen with blazing fires. 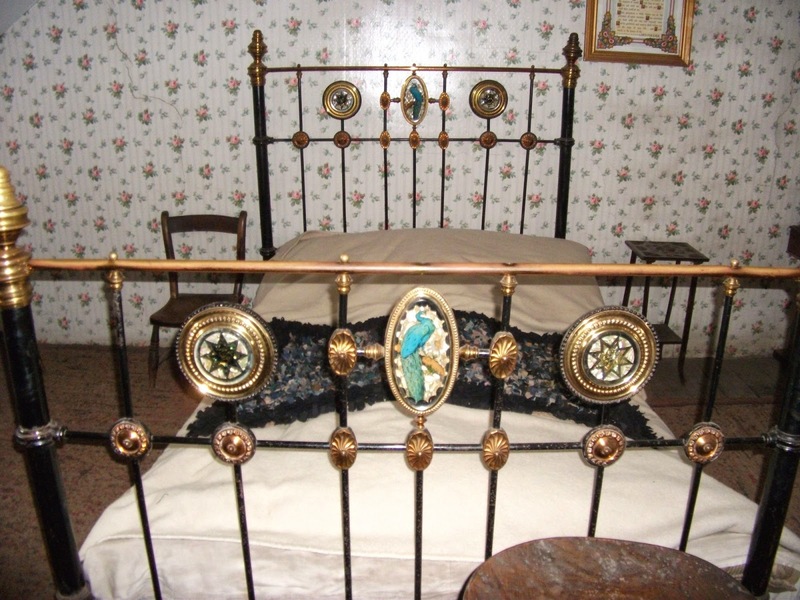 One of the bedrooms had this beautiful bed. 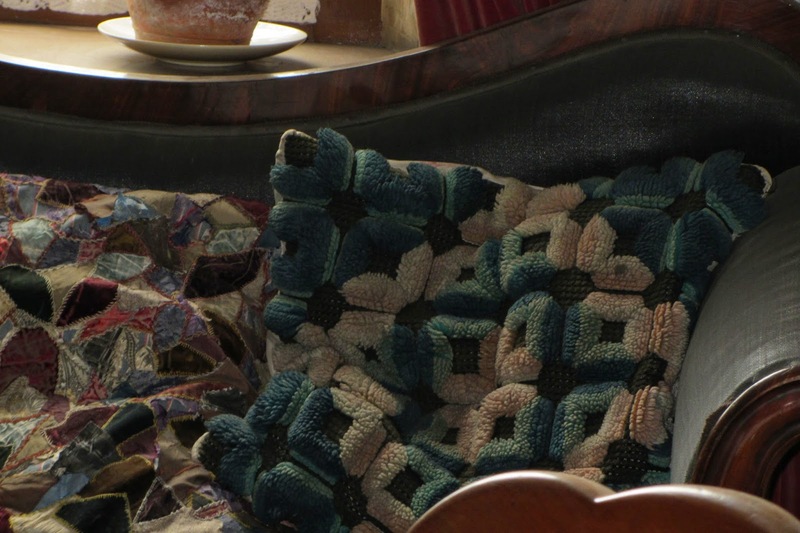 We also espied these lovely cushions. The one on the left looks as though it is patchwork, the one on the right looks as though it could be a form of candlewick. We couldn't get close enough to find out. The picture was taken using a telephoto lens. There were floral buttonhole making sessions in the Band Hall but we didn't go in. 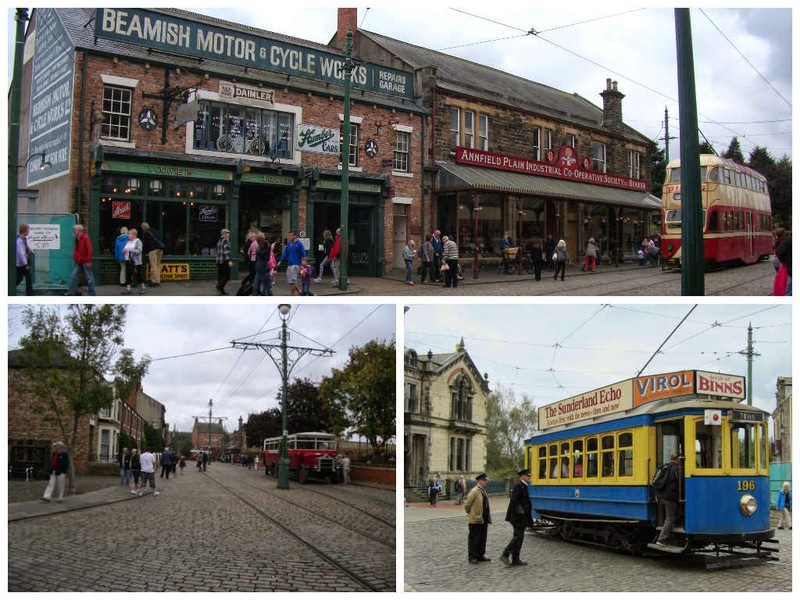 Even at this early stage of our visit we were wondering if we would have enough time to see everything Beamish had to offer. We gave the school a miss as well. However, we did visit the colliery stables which were home to three ponies. 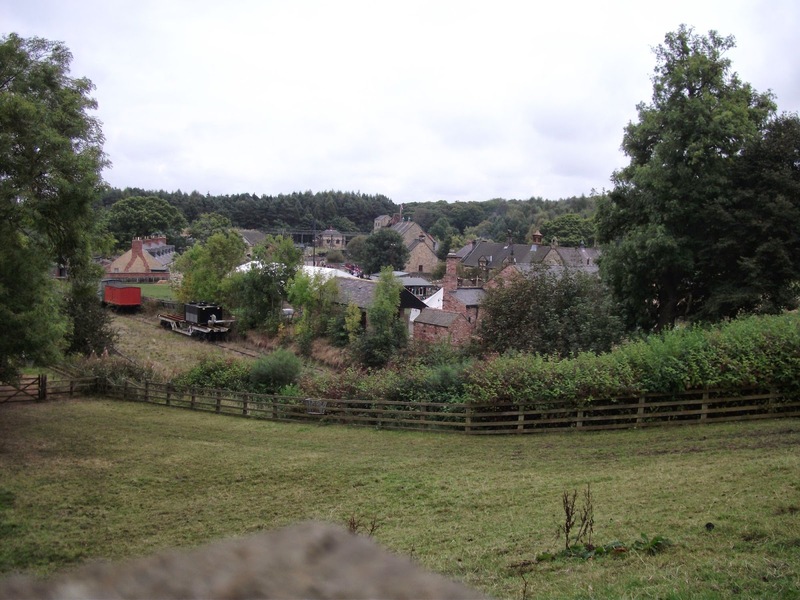 As we walked on to the 1940s farm there was a wonderful view of the pit village. Before going to the farmhouse and farm cottages we stopped at the British Kitchen for rest and refreshment. Initially I misinterpreted the name, thinking it was an exhibit of a 1940s-style kitchen and cooking demonstrations. We were glad we stopped there. 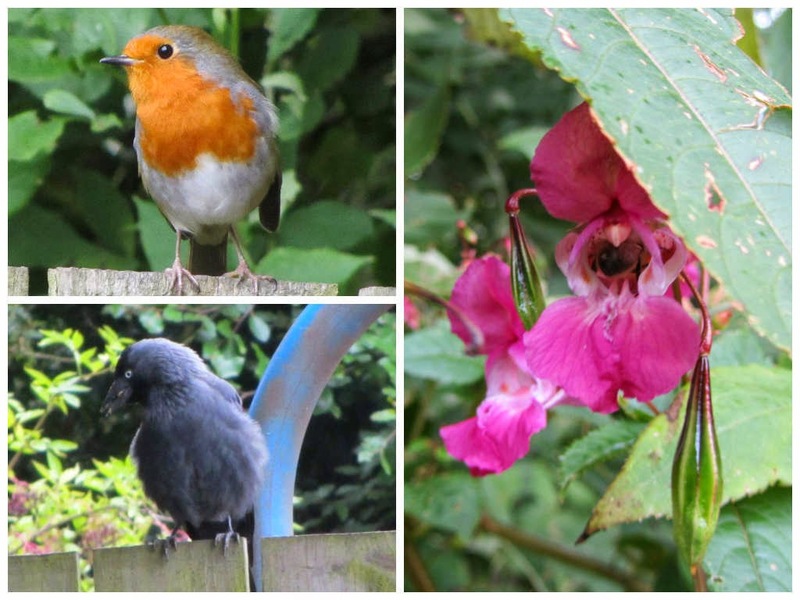 A cheeky robin kept appearing on the fence, probably hopeful for some of our scraps. Behind the opposite fence was a clattering of jackdaws. With the comings and going we think that we counted eight. There seemed to be some food behind the fence because the birds always had something in their beak when flying from the ground to the top of the fence. Bees were visiting some pink flowers, crawling deep inside. Somewhere inside the main flower in the photograph is a busy bee. In the farm cottages we found two women cooking, again with a blazing fire, another woman crocheting a snood and another knitting a scarf using a pattern from a Sirdar knitting pattern booklet for the Forces. We conversed with the yarn crafters. The young woman making the scarf had not been knitting for very long and I promised to email her the pattern for some garter stitch gloves, which I did. We also visited the main farmhouse. 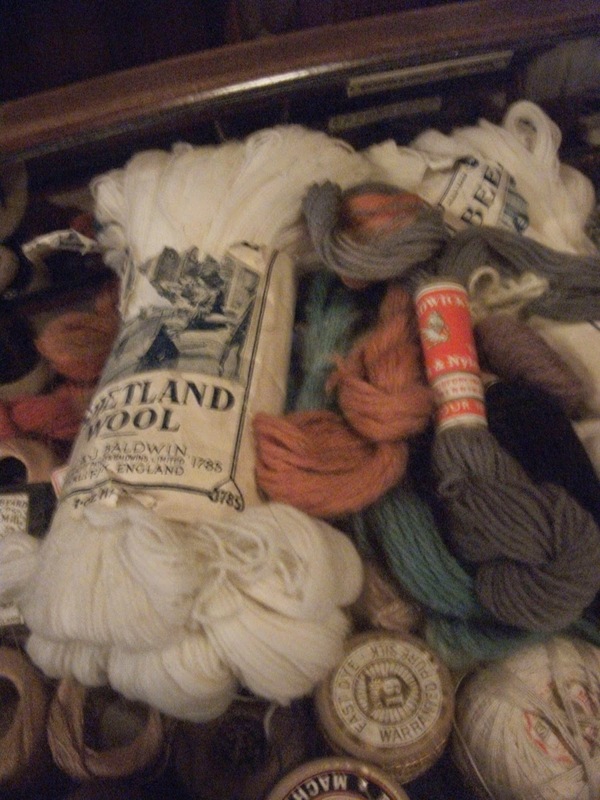 In all the houses we visited at Beamish there were rag rugs on the floor and some in progress. The Beamish gift shop had the book From Rags to Riches North Country Rag Rugs, The Beamish Collections ~ by Rosemary E Allan on sale and I am annoyed with myself for not buying a copy. 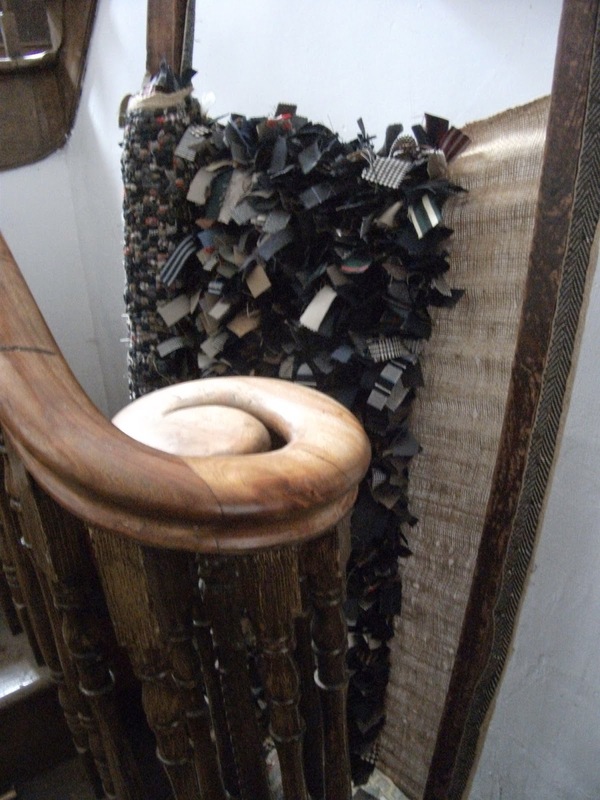 Rag rug in progress in the farmhouse. Alongside the farmhouse was a stable with three horses. The two horses nearest to the through footpath for the public were extremely good natured, allowing themselves to be patted, spoken to and photographed. The third horse was on the other side of one of these horses, in an enclosed space with no public access to go up close. I felt really sorry for him missing out on any attention and petting. We took advantage of the transport provided to travel to the 1910s town. We gave the fairground a miss ~ not our scene ~ and took just a cursory look at the railway station while we were seeing the town. We heard what we thought was a steam engine but didn't see it, even after waiting for some while to see if it would arrive. 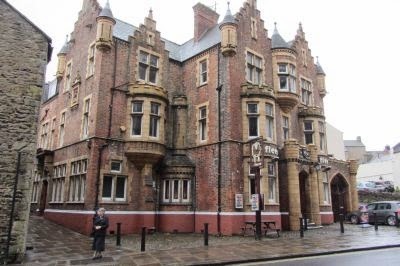 When viewing the town we started off at the Freemason's Hall, at the opposite end to the railway station. An imposing building. The stained glass was breathtaking. Next door was Barclays Bank. 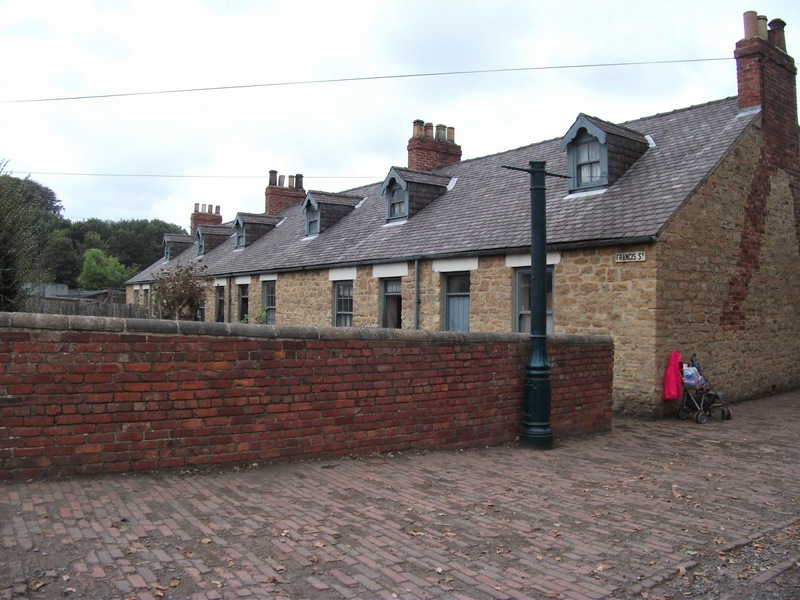 The town also boasted a baker, a Co-operative store, garage, sweetie shop, music teacher, dentist, and more. Dave lost his resolve and bought some jelly beans. The town also had a beautiful park. The Annfield Plain Industrial Co-operative Society shop was stocked with anything and everything anyone could want ~ or didn't know they wanted until they saw it. 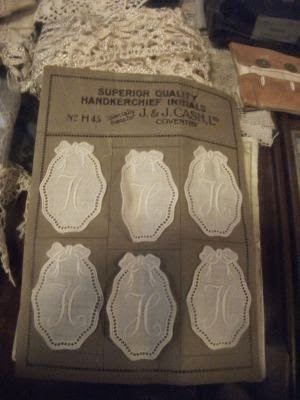 Here could be seen "Superior quality handkerchief initials" by J and J Cash Ltd, Coventry, and skeins of Shetland and other wools. In addition there were threads and haberdashery of all types. We caught the tram to the 1820s Pockerley Old Hall, which like the other exhibits had re-enactors. Lots of lovely things in here, including luxurious beds, more cooking, and not so dark as the miners' and farm workers' houses. 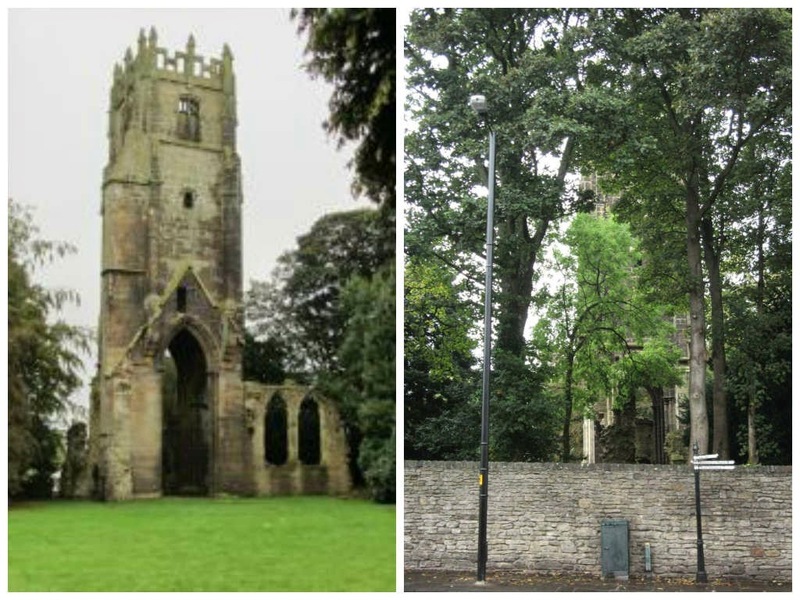 We took a slow walk down the slope to the medieval church under construction, St Helen's from Eston in Cleveland. Some of the bricks still had the chalk numbers on them so that they could be reassembled in their correct places.We rested while watching from a distance the 1820s Pockerley Waggonway. The guest steam engine The Steam Elephant chugged backwards and forwards with its motley collection of carriages. From there we walked to the tram stop. 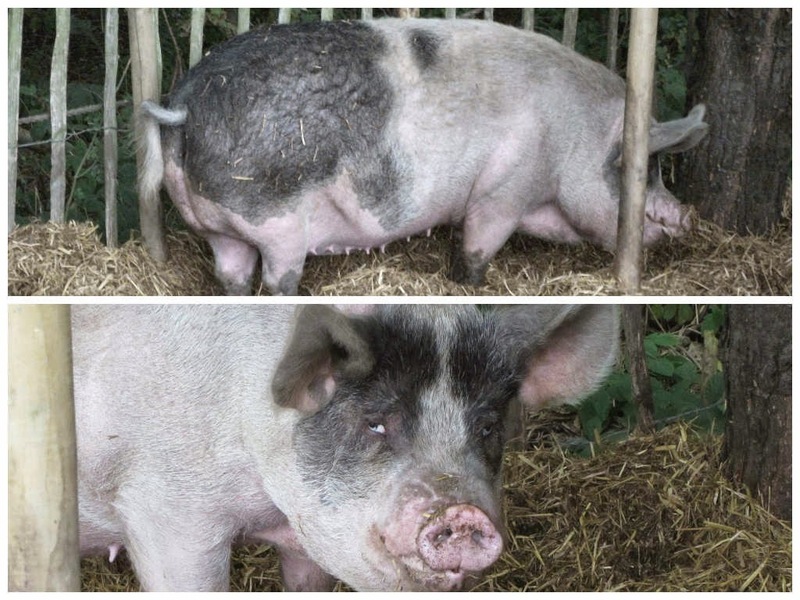 On the way we met a glorious pig. The photographs do not do justice to her enormous size. We caught the tram up the hill to the entrance building, the shop and the refreshments. 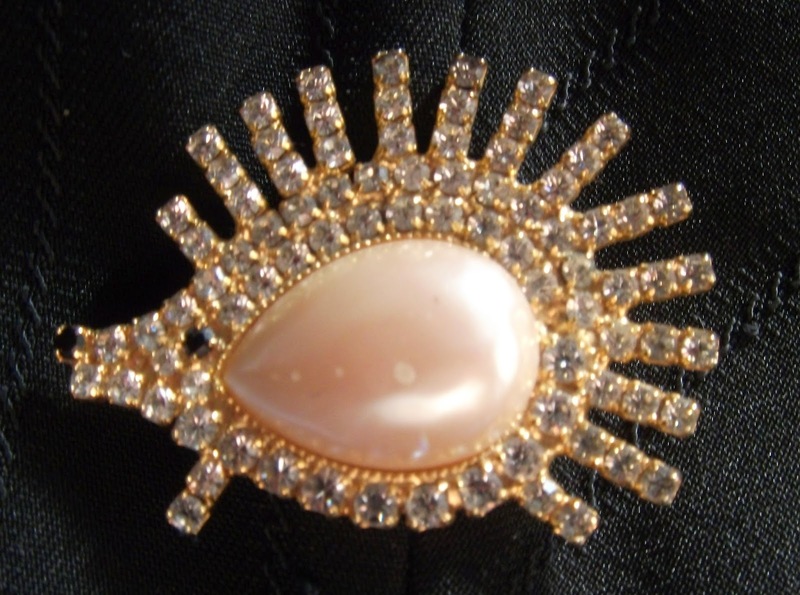 While we were enjoying our cup of tea a woman asked me where I had bought my brooch. Dave had bought it for me about twenty years ago so I doubt if the same design would be available now. She was disappointed because her friend "back home" in America is hedgehog crazy and would have loved a brooch like it. Dave was able to give her the website addresses of the British Hedgehog Preservation Society and Hedgehog Care and she went away happy. We found our way back to the coach and travelled back to the hotel tired but content. On Monday we travelled home via Richmond, North Yorkshire. 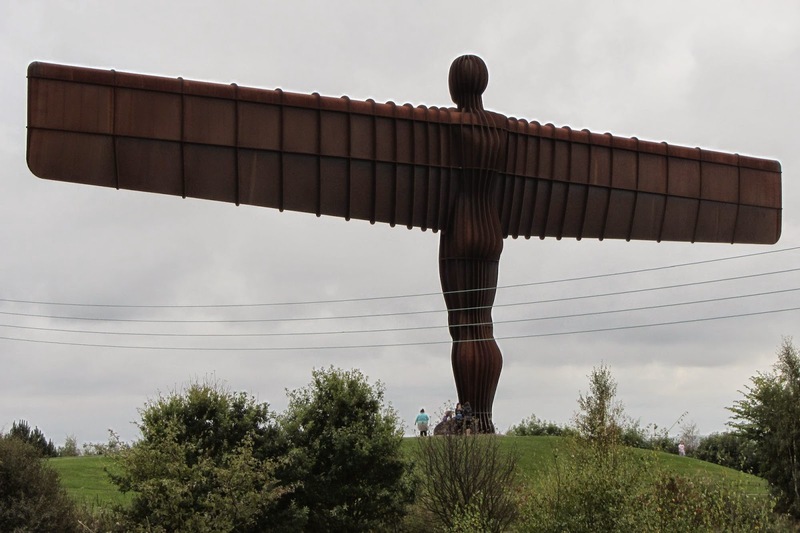 On the way we saw the Angel of the North, stopping for a photoshoot. 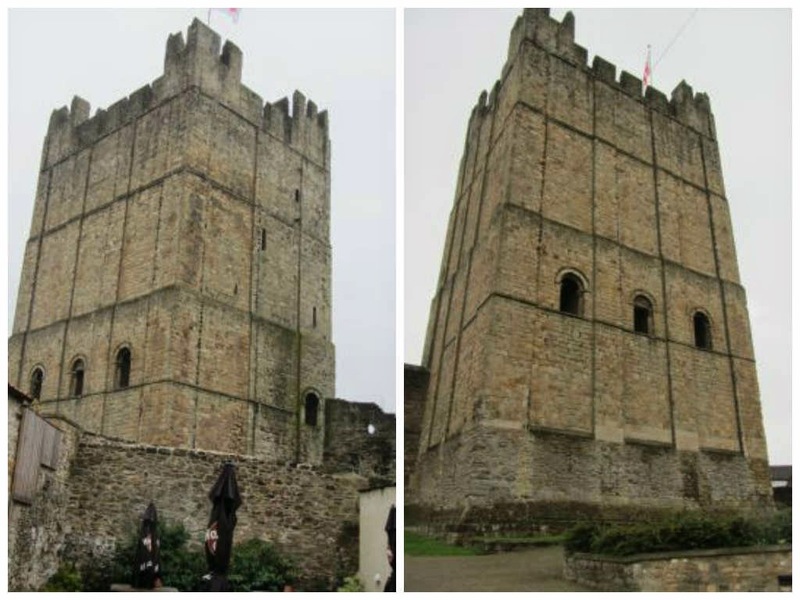 At Richmond, the first building we wanted to see was Richmond Castle. Not sure how long it would take us to properly explore the castle and knowing that there were many other buildings we wanted to see in the time available we didn't go in. 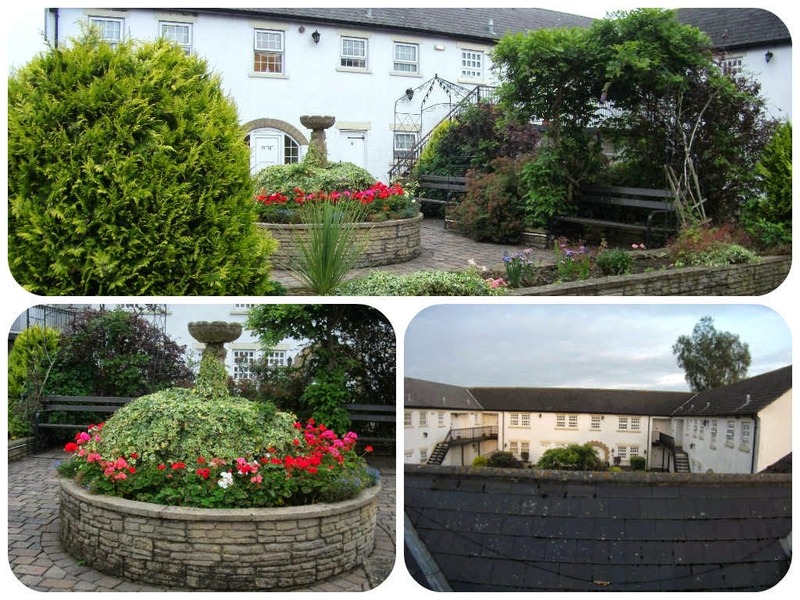 The area at the front of the left picture above was the beer garden of The Bishop Blaize public house. 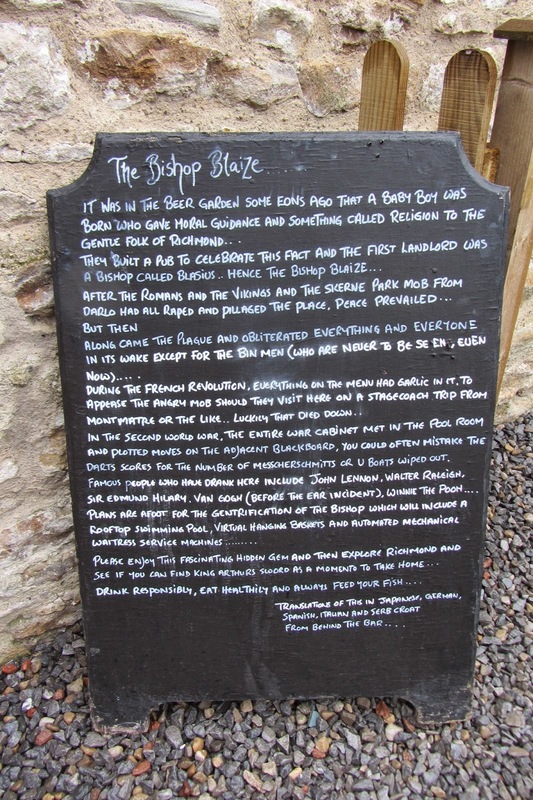 We were amused by the potted history of the town written on the blackboard. We carried on walking, liking the town very much, but we were not too sure of the cobbled walkways under our feet on steeply sloped streets. We were glad that it wasn't icy or snowy weather. From the castle we found our way back in Trinity Church Square and on to Friary Gardens. 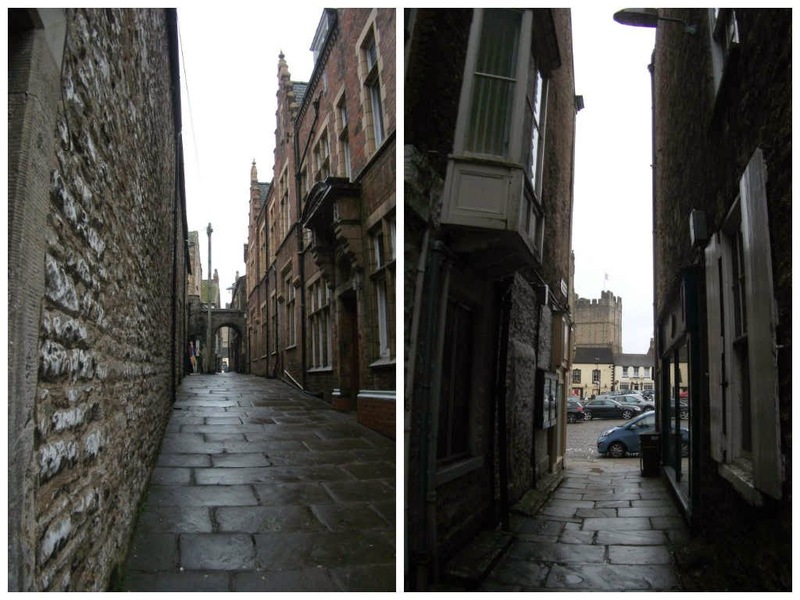 We then started to walk along Friars Wynd, which is directly opposite the view of the Friary ruins shown in the above picture on the right, back towards Trinity Church Square, past the Georgian Theatre Royal and one of the postern gates into the town. 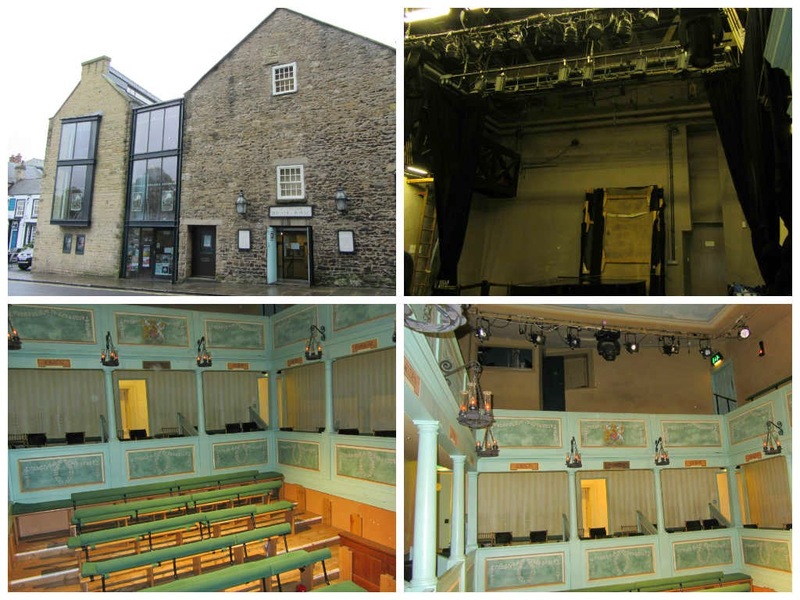 We decided to view the inside of the theatre and experience a treat to the eyes, to the mind and to the soul. The guide was so very knowledgeable and enthusiastic about the theatre. A visit highly recommended to any visitor to Richmond. Entrance to Friars Wynd from opposite the Friary ruins. Friars Wynd looking towards Trinity Church Square. The postern gate can be seen in the picture on the left. 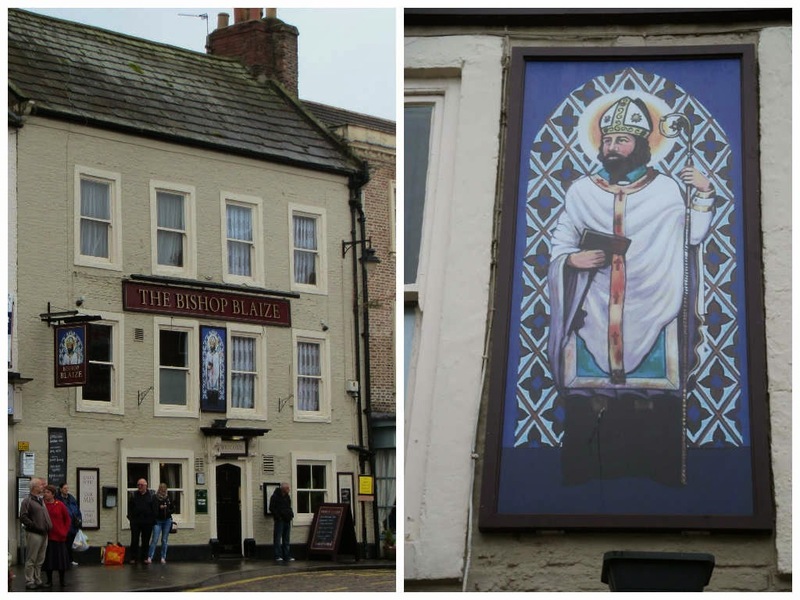 We came out by Trinity Church and almost opposite the front of The Bishop Blaize public house. We found the Cross View Tea Rooms & Restaurant for cups of tea and enormous cakes before boarding coach for home. When not sleeping on the coach I had done some knitting while travelling and also when at the hotel. There were other women knitting on the coach also. I was able to complete three garter stitch scarves for younger children for Shoeboxes, two knitted vertically with pointed ends and one knitted lengthways/sideways. The pointed scarves are easy to make. Work right side rows as "knit one stitch, knit two stitches together, knit to the last two stitches, knit into the front and then the back of the next stitch, knit last stitch". Work wrong side rows as "knit every stitch" without shaping. When measuring, let the needle lay at the same angle as the cast on edge. 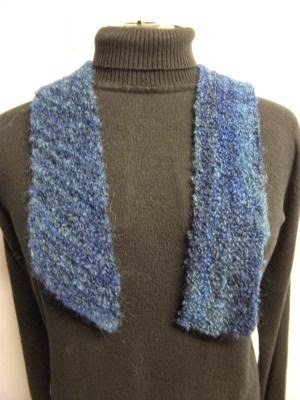 Note that the scarf width will be narrower than the cast on edge as a result of the sloped knitting. The yarn for all three scarves was donated Patons Mona Lisa worked using 4.5mm needles. Pictures below. 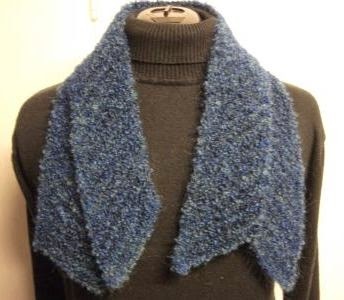 Two garter stitch scarves with pointed ends. Shown together to prove I am not claiming the same one twice! Garter stitch scarf worked lengthways/sideways. 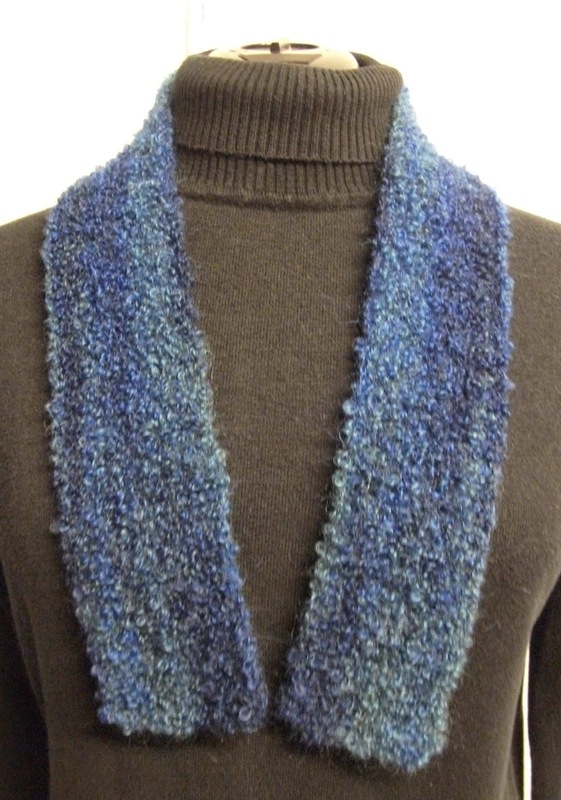 and one garter stitch scarf worked lengthways/sideways. 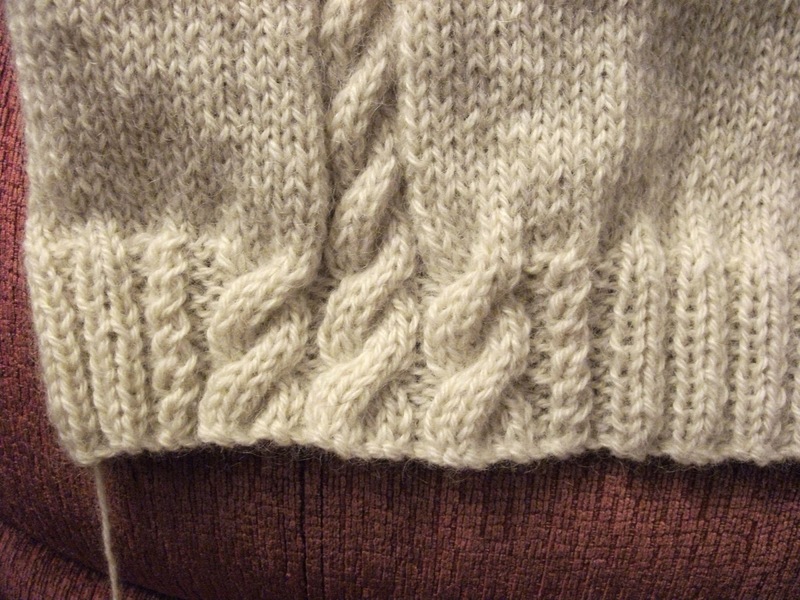 The yarn is variegated and the direction of the rows can be seen. We reached Peterborough with a smooth crossover to the feeder coach to take us back to our original pick up point. Here we took a taxi for the short distance home. We had had a superb and happy time, so glad that we had experienced this holiday. We knew we were back home after we had been indoors only minutes, when there was a telephone call from someone trying to sell us solar panels.